People have been getting confused. Confused as to why I call Sammy a Gelfling. Well clearly it is because that is what she is. So I am here to dispel a couple of myths about the myth that is the Gelfling. Gelflings are vegetarian. Sammy has a lot of meat cravings going on right now so there is a chance she could be booted out of Gelflingness by the Gelfling Grand Poobah (maybe she’s craving a different type of meat?). She raises her fist in defiance and challenges any Gelfling who is apposed to a sausage every now and then (once again not sure if we’re talking about the same thing). They have strange looking pets. See photo above. And what have Gelflings brought to the table that is the world we live in today? Well that’s a toughie… I’m certainly offending Gelflings everywhere right now… I don’t know… cuteness? A job for pointy ear ear-muff factory workers? i LIKE! 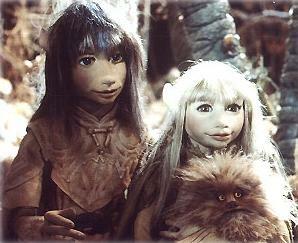 i feel i am akin to the gelfling, maybe not all the elements associated, esp. because i most certinaly do have a computer, but that is all the more likely to assit in preserving those oblong shaped eyes. i don’t have a strange pet, but i think i could have one if the pet decided it wasn’t my pet and roamed free … and i have to say graz, point 4 about extending one’s family… in this day and age, family is whatever (and whoever) one decides, or no? … and before you start disputing that, i consider you guys as part of my family 😉 g.
Well I certainly can’t take the piss out of that. At last! Someone has set the record straight on us Gelflings. But I don’t know about the pictionary point… I was a graceful loser to the happy couple on Tuesday… but we are NOT allowed to lose again, OK?